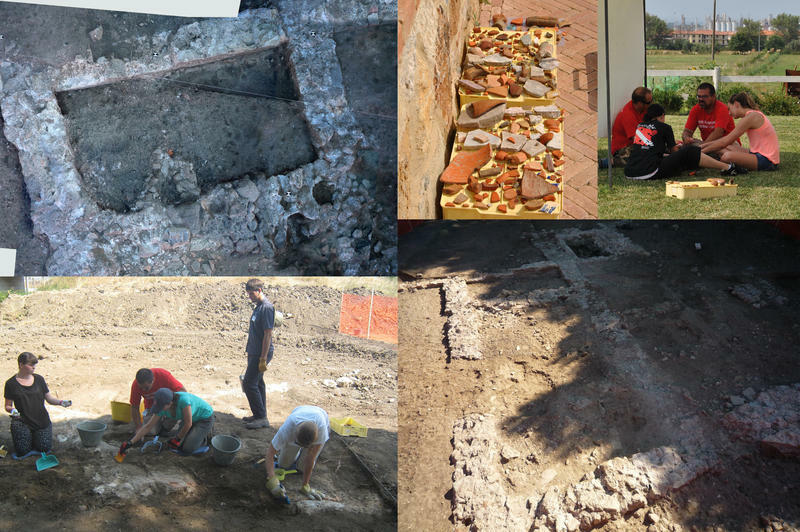 Our project stems from the archaeological researches the Laboratory of Ancient Topography of the University of Pisa has been conducting for over twenty years at St. Gaetano di Vada (municipality of Rosignano Marittimo, Livorno), along the coast of Tuscany. 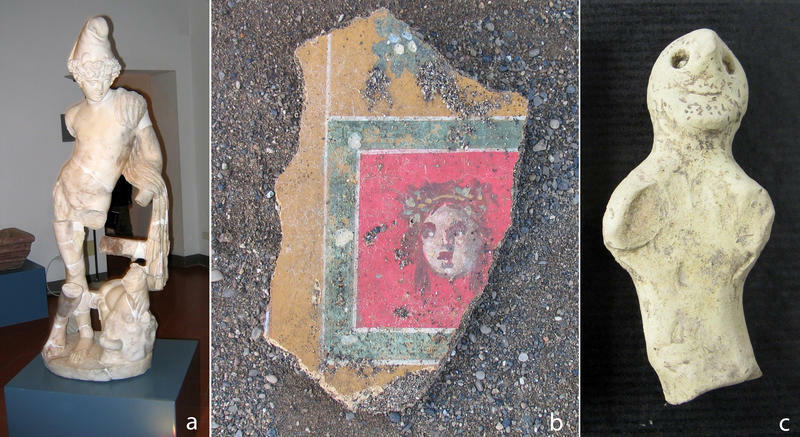 Here a settlement of considerable interest, related to the harbour system of the famous Etruscan and Roman city of Volterra, has been found and partially excavated. Now the Laboratory of Ancient Topography is going to start a Summer School opened to foreign and Italian students of archaeology, who wish to live an experience of archaeological excavation in Italy. conducting tutorial activities that allow participants to understand the scientific method that archaeologists use today, starting from when a site is identified through surveys and GPR (Ground Penetrating Radar) investigations until the stratigraphic excavation. the scientific research of the University of Pisa will extend to a new area of the settlement, recently identified through geophysical surveys. Participants will be deeply involved in this new adventure, thanks to a team of skillful archaeologists. Lectures will focus on the history and archaeology of the harbour of Vada Volaterrana and its surroundings and on archaeological methods, in order to explain students all the activities they will face during the excavation on site. The Etruscan and Roman city of Volaterrae - the current Volterra, in the core of Tuscany - was connected to the coast by the Cecina River valley; the main port, whose name was Vada Volaterrana, was located further North of the mouth of the river, at S. Gaetano di Vada. The quarter was built, according to a plan, during the Augustan age. Many building have been unearthed in time: two thermal baths, a large warehouse (horreum), a water tank, a monumental fountain - used for watering the animals - and the head office of the guild (collegium) in charge of port activities’ management. The corporation’s member were worshippers of the Eastern god Cibele, whose lover Attis’ marble statue was found in the cold pool (frigidarium) of the main bath house, where it was intentionally thrown in broken pieces in Late Antiquity. A recent GPR (Ground Penetrating Radar) survey allowed us to identify in the Southern sector of the harbour settlement, the structures of more buildings, whose excavation started in 2013. The most ancient structures belong to a small bakery dating to the 1st cent. AD, where a round oven for the making of bread was found. During the IInd cent AD the bakery was deloshed and a new huge rectangular building, measuring 18x8 m, took its place. Some rooms - two of them can be probably recognized as warehouses - surround a central open courtyard. In the Western sector of the area, next to the bakery, the excavation of walls foundations allowed us to intercept sandy layers containing Roman Age pottery mixed with Bronze Age one. The Roman Age harbour quarter was built on a sandy dune, in turn covering a Late Bronze Age settlement involved in salt production. During the 2016 campaign the excavation of a third building, added to the Esatern side of the rectangular one, were started. Here a Late Antiquity metal workshop has been discovered. Inside one of the warkshop's rooms a small round kiln for smelting bronze objects was dug out. In 2019 Eastern sector's researches focused on two more rooms, both characterized by a rich marble slabs decoration. At the end of the campaign we've been able to end digging in the small square Room 10, whose marble floor had been destroyed and replaced by a poor roof-tiles floor. East of this one, the perimeter walls of a large apsed room (no. 11) have been discovered. This room is the Easternmost of the entire area and the starting of its excavation will be one of the aim of next campaign. Its funntion is still unclear but the richness of its floor testify it was used for important events. The findings of amphoras, pottery, coins, glass vessels and marbles testify the intensive trade activities; every kind of goods arrived from the entire Mediterranean Sea basin, to be redistributed from the port to the countryside and the city of Volaterrae, and here local products were shipped out. 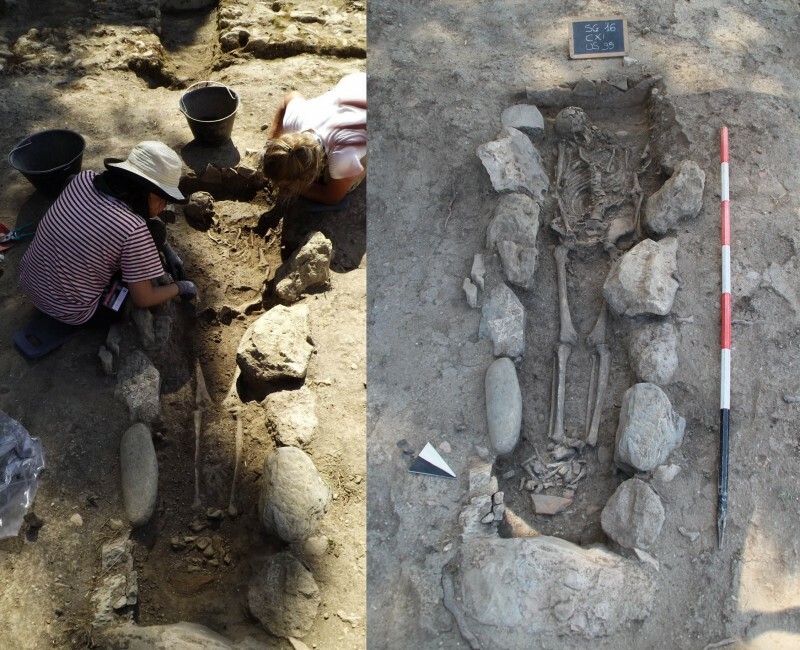 One of the major goal of our excavation is the discovering in 2013 of a Late Antiquity necropolis; the burials date to the Vth-VIth cent. AD, when the building was already abandoned. During the 2015 campaign we started a an anthropology lab, which focused on the skeleton of one of the 2014 tomb. In three cases big amphorae were used for laying the bodies, according to a common habit during the Late Roman Empire Age. A few bones allowed us to identify one of them as the burial of a 4-5 years old child. The most interesting tomb - a very poor one – has been used for two different burials: all the bones belonging to an earlier skeleton- but the skull - were subsequently piled up in the western part of the tomb, in order to make room for a new body. In 2017 two more tombs - an adult male and a child one, the latter buried inside an amphora - have been dug out too. If you want to learn more about 2018 excavation season download the "Vada 2018 report" (see above). Excavation, tombs, survey, GPR analysis, drone survey, Late Bronze Age, Roman age, ports, warhouse, trade, amphoras, pottery, Italy. No prerequisites are requested for the field school; students will be trained for all the activities they’ll experience. Our summer school welcomes University students in Archaeology, Classics, History, and Arts at the undergraduate and graduate levels. Students and staff will stay in a new agritourism, housed inside a restored typical Tuscany farmhouse, located in the countryside East of the town of Rosignano Solvay (municipality of Rosignano Marittimo, Leghorn), close to the railway station (2 miles/3,2 km far), the city center (2,2 miles/ 3,5 km far; ) and the beach (3 miles/4,8 km far). The archaeological site of Vada Volaterrana is about 4,3 miles/7 km South. Students and staff will stay in apartments with kitchen-living rooms, bedrooms and bathrooms for 3-5 persons. Internet access and laundry will be available at the accommodation. The food will be provided by a local restaurant specialized in Italian cuisine, located close to the excavation (about 4,3 miles/7 km far from the accomodation). The breakfast, consisting of coffee or cappuccino and pastries, will be consumed at the accommodation; lunch which will be consumed on the excavation (students and staff will be provided with lunch-boxes). Dinner, consisting of typical Italian courses, will be held at the restaurant (the cost of the summer school includes water; all other drinks are excluded). Every effort will be made to accommodate students with severe food allergies (nuts, shellfish, etc. ); students with severe food allergies are required to communicate their specific dietary restrictions to the field school’s organizers immediately upon admission. We will try to accomodate individual lifestyles and dietary choices (vegetarianism, veganism, etc.) too. Meals are provided during weekends, when the field school is not in session. At request, it will be possible - every three or four days - going shopping; students may communicate staff members what they want to buy. €1,990 (around $2,1000) for 3 weeks. These fees will cover transports from and to the site, housing, meals, excavation, laboratory equipment, and staff costs. There are no application fees. International travel to Italy is not included in these fees and is the students’ sole responsibility. For the 2019 campaign, Pisa University will grant two 500.00 euros scholarships. This money will be used to pay part of the summer school's fee, which will be reduced to 1490.00 euros. The summer school staff will unchallengeably choose the persons to whom give the scolarships. Number of credits offered In order to enable students to obtain credits from their Universities, the Laboratory of Ancient Topography of the University of Pisa will issue signed certificates for all the activities made during the Field School, specifying type and hours, for 6 Pisa University credits. Participant will be examinated in order to get the credits. The exam will consist in the following parts: 1. Oral examination. 2. Practical test. The student will got a vote of a maximum of 30 points, 18 points being the pass mark. M. Pasquinucci et alii, Ground Penetratine Radar Survey of urban Sites in North Coastal Etruria: Pisae, Portus Pisanus, Vada Volaterrana, in F. Vermeulen, G.-J. Burgers, S. Keay, C. Corsi (eds. ), An offprint from urban Landscapes Survey in Italy and the Mediterranean, 2012, pp. 149-159. 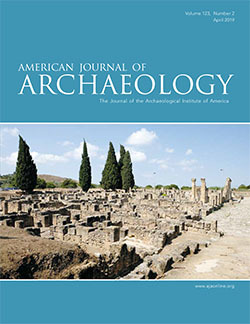 M. Pasquinucci – S. Menchelli, The landscape and economy of the territories of Pisae and Volaterrae (coastal North Etruria), in Journal of Roman Archaeology, XII (1999), pp. 123-141.